Good afternoon all and a big thank you to everyone who left me a comment recently. It is so lovely to hear that you like what I am doing! So this is another entry for the shades of blue competition over at Less is more. I mentioned yesterday that I was a bit dubious about this challenge as I don't normally use that much blue, but it has really kick started my stamping mojo and this card was a result. The shades of blue on the left hand side were punched using the eyelet border punch out of scraps of designer series paper that I had run through my big shot. This is the huge advantage of clean and simple cards, and punches like the border punches, you can use up all those scraps of card and paper that you just can't bear to throw away but then never use! As I mentioned before, all of my cards are being designed as birthday cards because I have run out! 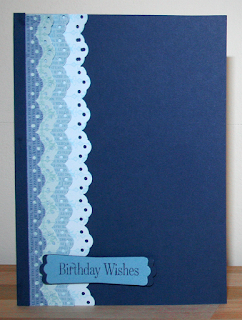 I stamped this wonderful birthday greeting from occasional quotes using Night of Navy ink on to Marina Mist card. I stamped first and then flipped the punch over so I could see through the aperture and positioned the greeting so that I could punch it. This saves a lot of hassle with sentiments going on wonky! I then punched another shape using the modern label punch out of Night of Navy card stock, cut it in half and then positioned it to give the border around the marina mist card stock. This card is growing on me, I don't like it as much as yesterday's but it is easy to reproduce, and I might try it with more of a rainbow effect on the decorative papers. Hope you liked it too! Nice one - clean and crisp - great for men's cards too. Thanks for posting. Love the look of your card. It's so beautifully stunning.